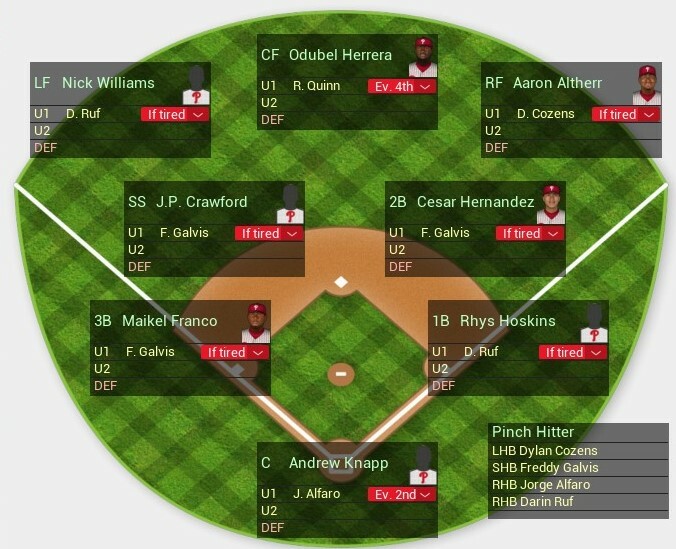 Last time, we saw what Out of the Park Baseball 17 had to say about the 2016 Phillies and found that it was mostly right about the general outcomes but really messed up some of the details. In predicting the team’s 2016 record and performance, it was at least consistent and believable. Today, we’ll give the people what they want: prospects. The other attitude is that a highly touted prospect could, at any old time, be plugged into the major league lineup without missing a step regardless of his actual age or readiness. Forget growth; forget the difference in competition; forget the glaring holes in a minor leaguer’s game that would be exploited by major leaguers; forget how even J.P. Crawford, with his refined understanding of the strike zone, struggled at triple-A last year; forget all that and bring those guys up now, and they’ll be better than the fellas we keep on the 25-man roster because the front office suddenly forgot about this untapped wealth of resources playing in Reading, Allentown and elsewhere. Despite my petty, passive-aggressive stand against those misunderstandings, I’m giving these hypothetical radio callers exactly what they want: I’m calling up the farm. 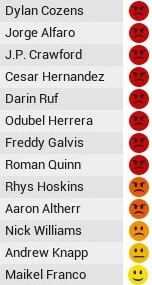 The best or most talked-about player at each position made it onto my 25-man roster this season, though I did keep now former Phillie Darin Ruf because the vocal “give Ruf a real chance” crowd generally overlaps with the “just call up the prospects even if they’re too young to vote” crowd. Also, since this game was made before the actual 2016 season, Tommy Joseph doesn’t have high potential. I did limit my promotions to players that fans might actually suggest calling up in the immediate future. So, while Cornelius Randolph and Franklyn Kilome, for example, are thought of highly, they’re probably not the options people will jump to next time the Phillies lose a player to injury. The pitching rotation became Nola, Velasquez, Hellickson, Eickhoff and Jake Thompson. While not all prospects, the rotation is a part of the roster the Phillies have done a good job solidifying, so it’s unlikely that many fans would call for immediate promotions to replace any of those pitchers. My soapbox aside, I didn’t think the simulation would go too terribly. The infield seemed pretty solid– the game considers Crawford an upgrade over Galvis, completely adores Maikel Franco, and doesn’t distinguish much between Ruf and Howard. (I don’t blame it for any of that.) I also didn’t think the outfield would be worse by any substantial amount than it was with a full season of Tyler Goeddel, Cody Asche, and Peter Bourjos getting regular playing time. I figured that, if anything, maybe Roman Quinn and Aaron Altherr could hit the ground running and luck into some improvement over what was there. What happened was, well, not that. I only ran this simulation twice for fear that running it a third time would make my computer become self-aware and throw up on me out of disgust. The first season I simulated ended with the team 52-110 and ranking worst in the National League in runs scored, batting average and on-base percentage. The pitching wasn’t great but also wasn’t much worse than it was in the original simulations, which isn’t surprising because it hadn’t changed a whole lot. In the second trial, the team went 53-109 (an improvement) and still ranked last in the above batting statistics. They scored the same number of runs both seasons— 548. The second time, they finished 50 games out of first place and only won 5 games in September. Okay, maybe not. They hate me. Should we call anyone up? Obviously I don’t take my advice from a video game, thank you. That’s a lesson you only need to learn once. But, if I did, is there anyone this game thinks it would be safe to put on the active roster? As we saw in the original experiment, OOTP is a big J.P. Crawford believer. Despite his age and inexperience, he’s performed reasonably well in every season I’ve simulated. This makes sense because of his profile and abilities: he plays good defense, which is valuable enough at shortstop to help him stick while his bat catches up, and has a mature understanding of the strike zone. Hardly anyone reaches the majors and is an instant superstar, but those skills should allow him to show up and not completely flounder. Everyone knows J.P. Crawford is a stud, though. The next most viable option, according to OOTP, is Andrew Knapp. This is reassuring given how likely it is that he’ll start the season on the 25-man roster. He was worth 1.3 WAR in less than 100 games started, making him a solid but unexceptional member of the team. He, like Crawford, plays a position that can contribute in big ways without the bat, so playing good defense could let him accrue value despite the .218/.281 /.361 slash line he scratched out this season. The game sees him as an average catcher defensively (maybe a pipe dream to start), and it makes sense that defense would carry into the majors more easily than hitting. By this logic, though – the thinking that guys playing good defense could hold their own while they adjust to big league pitching – it’s surprising that the game didn’t project Roman Quinn positively. He also plays fine defense at a premium defensive position, and has the speed to get on base and do damage when he does. Instead, he hit under .200 and played below replacement level. His 27% strikeout rate – remarkably close to the 27.5% he had in his real major league debut last season – is a likely culprit for this. He’s a player who can make things happen just by putting the ball in play, but only if he actually puts the ball in play. Still, I think we should be pleased with how his real-life debut went. Other than that, the team was mostly hitting under the Mendoza line. The Phillies’ offense has been one of its most frustrating weaknesses over the last few years, but this experiment suggests that calling up the farm must be done in moderation and will likely not be the quick panacea many want. Again, I’m not quite deluded enough to look at this game as actual proof of anything, and I’m not going to call a bookie based on what happens here. But that won’t stop me from looking through the results of whatever projection systems exist, even if the projection system in question is one that lets me rename the Phillies the Philadelphia Turd Blossoms. We’re interested more in investigating how the system works than we are in the precision of how the exact statistics match up with real life. So it’s fine that, as with all petty internet squabbles, this “research” will convince no one of anything. But it does seem evident to me, with or without OOTP backing me up, that player development is important and takes time, patience, and a little luck. Matt Klentak has made smart decisions in his tenure as general manager; if he trades for Clay Buchholz, who is not an ace, maybe it’s because there are reasons for Jake Thompson and Co. to spend more time in the minors. Next time, I’ll drop the pretense of doing “research” and start cloning people.